This recipe was originally published on January 24, 2015 and republished on January 17, 2018 with updated content, photos and a video (located in the recipe card). A few decades ago, I would have definitely classified this particular food combination of pasta and lentils as one of my least favorite foods. Fast forward to today where this Easy Pasta and Lentils Recipe has become one of my go-to meals for a quick and healthy supper, especially during the long winter months. And the leftovers of this hearty pasta recipe taste even better. As a working mother, I would like to add that I love cooking with lentils because they are extremely versatile and forgiving. As an added bonus, they pick up the flavors of whatever food they are cooked with. Experiment and explore the many varieties which are available. Today, I have decided to use the brown lentils. 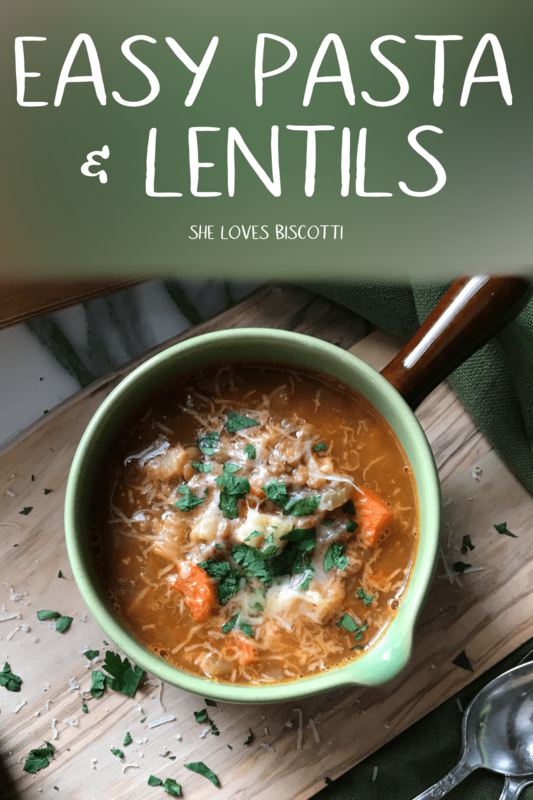 Let me show you how this pasta and lentils recipe comes together. As you may have probably guessed, there are a lot of vegetables (the regular culprits) in this Easy Pasta and Lentils Recipe. First, get all your vegetables ready and chop them all up. Start by drizzling about 1 tablespoon of olive oil and sautéing the garlic; then add the onions, carrots and celery. Allow the vegetables to soften -this should take about 5 minutes. Next, add the potatoes, lentils, bay leaf and passata. You may be wondering what exactly is tomato passata? Tomato passata is pureed tomatoes which have been sieved. It has a very smooth and silky texture. It is perfect for stews, soups, casseroles and of course this pasta and lentils recipe. It is usually sold in a glass bottle and very convenient to have in the pantry. It is what I use when I don’t have small amounts of tomato sauce available. We need about 1 cup of passata for this lentil pasta recipe. Add the water (or low sodium vegetable broth) and allow to simmer for about 20 minutes or until the lentils are just about done. Of course we cannot have a hearty pasta with lentils recipe without pasta. We will be using ditalini pasta today. You will notice that as the pasta cooks, the sauce of this pasta and lentils recipe thickens. This is due to the fact that the starch from the pasta is being released. 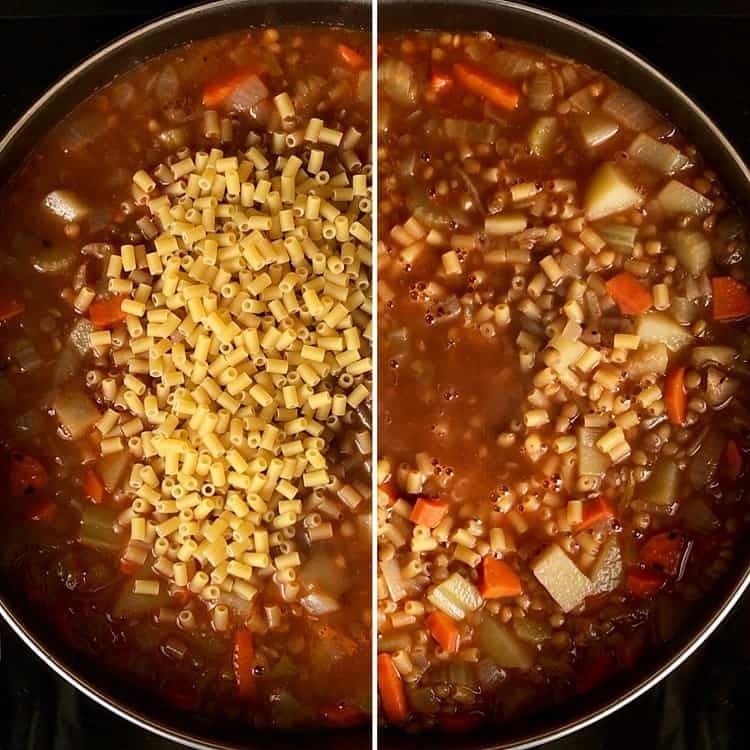 Feel free to adjust the thickness of the broth of your pasta and lentils recipe by adding more water. This is also the best time to adjust for seasonings. A dusting of cheese and parsley and voilà …you have just made one of the best lentil recipes ever! A low sodium or homemade vegetable broth can be used instead of water. 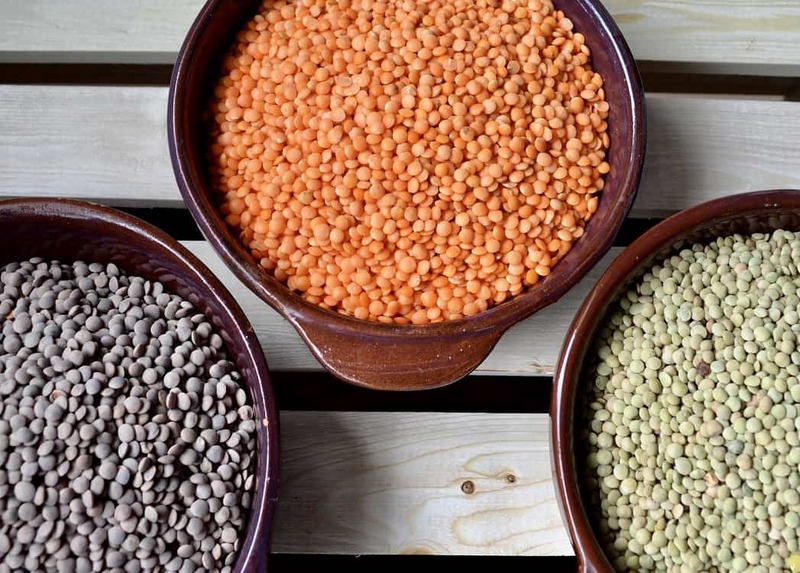 Always rinse and sort your lentils to ensure there are no impurities. The addition of parsley stems are a wonderful flavor enhancer in this dish. The pasta will absorb a lot of the liquid in this dish, do not be tempted to add more pasta. If not serving immediately, cook the pasta apart. When ready to serve, add the pasta to the rest of the cooked ingredients and heat gently. What is a good substitute for ditalini pasta? Any small shaped or short pasta works really well in this easy lentil recipe. Some examples are tubetti, elbow or even small shells. 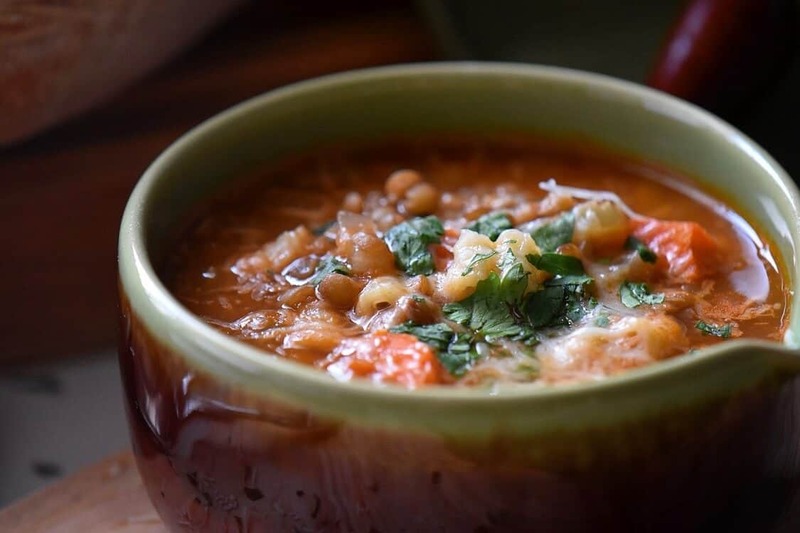 Can I use canned lentils instead of dry? Yes, if you are in a hurry, using canned lentils will decrease the cooking time by 20 minutes or so. Looking for more? Be sure to go to my Pasta Category for more recipes! As you have probably already guessed, I grew up with this recipe, as did hundreds of thousands of other Italians. Naturally, every family has their version and today I have shared mine. When I was a teenager, my paternal grandmother would always and forever be trying to teach us grandchildren some nugget or other of wisdom. And her biggest lesson? She would tell us a story (any kind of story!) always with the same moral: be grateful! So, what does this have to do with pasta and lentils? Well, I can’t help but remember my lack of enthusiasm whenever my mom or grandmother made this thick “soup” (which was really a meal). I really was not a great fan of this minestra di pasta e lenticchie…pasta and lentils. I often wonder about food conspiracy …why is it that the foods we absolutely did not appreciate in our youth, we can’t seem to get enough of as adults? Great-tasting, economical, healthy comfort food, Italian style in the form of an Easy Pasta and Lentils Recipe. My grandmother was right: there is a lot to be grateful for. Your health and taste buds will thank-you. ★★★★★ If you have made this Pasta and Lentils recipe, I would love to hear about it in the comments below and be sure to rate the recipe! This Easy Pasta and Lentils Recipe is a simple, comforting and wholesome meal. A hearty pasta recipe that is just perfect for meatless Monday. 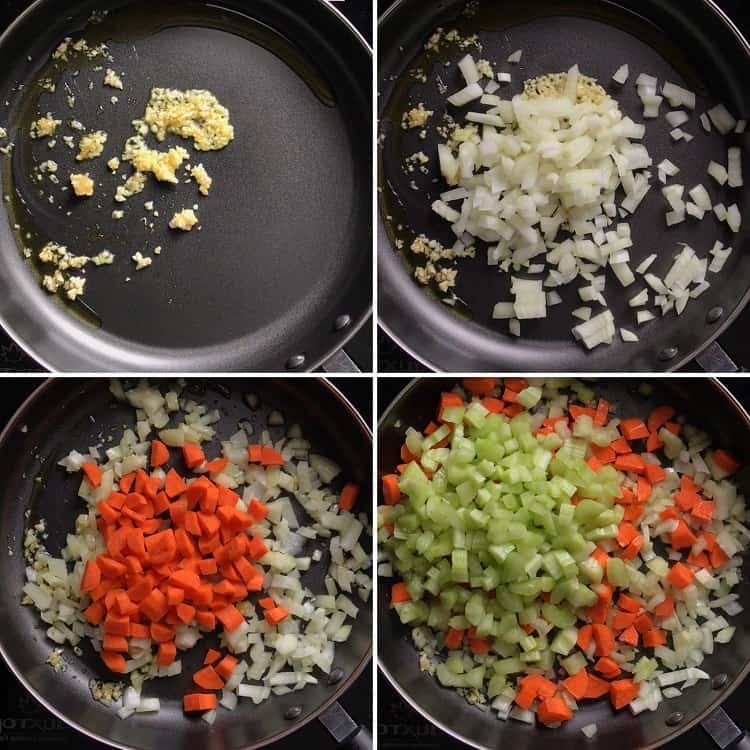 Saute the garlic, onion, carrot, and celery for about 5 minutes or until vegetables begin to soften. Add the bay leaves, lentils, water, passata and potatoes. Bring to a boil, cover slightly, lower heat and simmer for approximately 20-25 minutes or until lentils are almost cooked. Add the pasta (and if necessary more water) and cook, stirring often, until al dente (time will vary depending on the variety of pasta you use). Serve with a drizzle of olive oil and sprinkle with parsley and cheese.OPTIONAL: a squirt of lemon juice. Isn’t it funny how our tastes change over the years. The things our mothers wanted us to eat and yet they weren’t our favorites. Now we cook them with love. This is a dish that I make but without the passata…I can’t wait to try your version. Merci Maria pour cette merveilleuse recette. J’adore les soupes. Je l’ai conseillé à mon fils qui souhaitais cuisiner une soupe aujourd’hui. 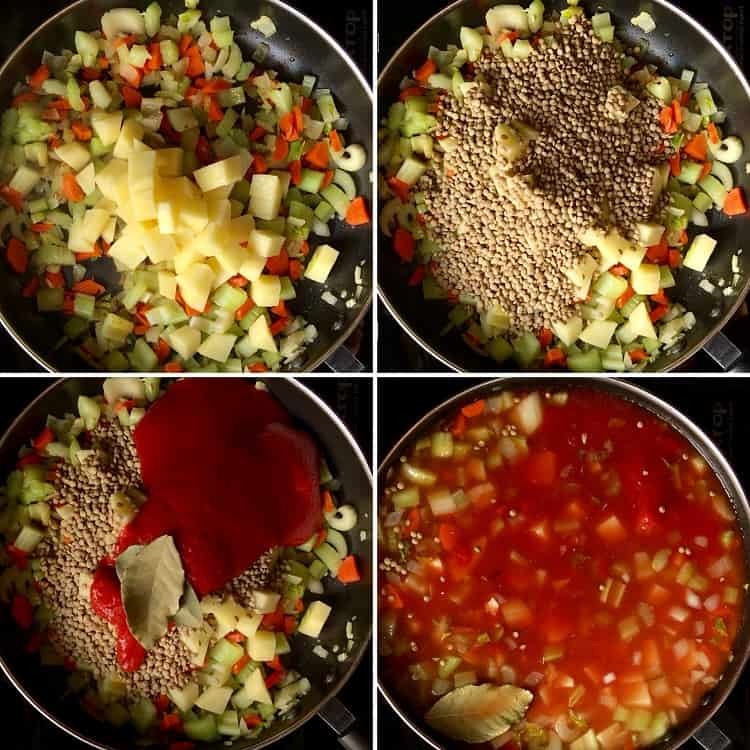 I make lentil soup and other lentil recipes, and I make plenty of pasta. But I’ve never combined them in one recipe. Yours looks so inviting, especially for a cold winter day. We love lentils in our household. Thanks Maria for sharing! Isn’t it great when our tastes evolve to appreciate more healthful food choices! I made a lentil soup for dinner last night. Yours looks lovely! Thank you for sharing. I Love lentils, unfortunately I always get stuck trying to think of new ways to use them outside of in soup haha! Thanks for this recipe idea, can’t wait to try it! I’m always on the look out for new lentil recipes. This one sounds delicious! What a great recipe! I love the detailed instructions and the photos! I cannot wait to give this a try over the weekend. It looks absolutely delicious. 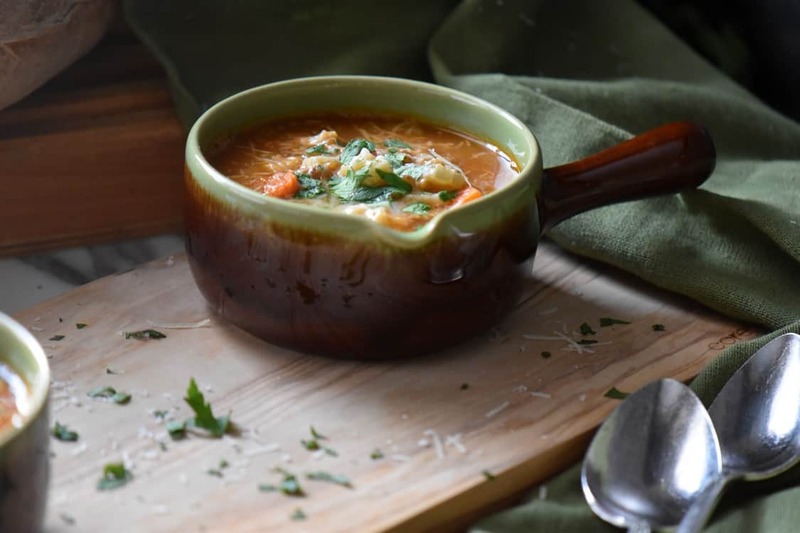 I absolutely love lentils and this looks like one healthy, tasty recipe I can totally eat in, like, 2 minutes flat 😉 I didn’t grow up eating them, but hubby and I now eat on the regular in our home. There’s so much you can do with them and they’re so inexpensive! Can’t wait to try this one out!